Nothing brings people together like a fondue party. 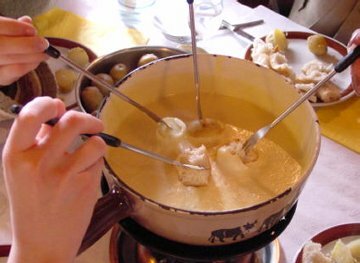 There is something process of eating fondue that satisfy all primal instincts. Stabbing an unsuspecting piece of bread from across the table with a long skewer, then cautiously dunking it in a bubbly pot of melted cheese. This recipe was tested at a fondue party along side conventional (and very fattening) cheese fondue, and this recipe stole the lime light, or well, fondue skewer. It works well with a rustic crusty bread or fresh veggies such as carrots and celery. Put all of the ingredients into a blender.Blend for a few minutes. Ensure that the oats are ground until fine. You are aiming for a smooth consistency. Pour this mixture into a heavy-based saucepan. Bring to the boil whilst stirring constantly. Reduce heat to low and simmer for a few minutes. Continue to stir. Keep cooking until the mixture turns thick and smooth. Prepare the fondue pot. 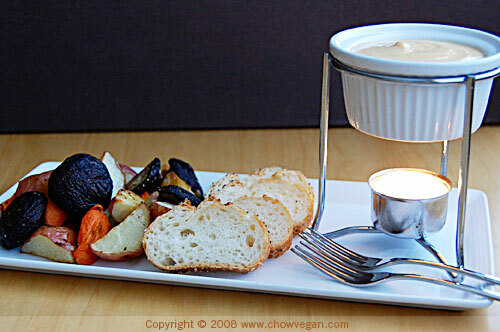 Pour in the vegan fondue and keep warm in the usual fashion for fondue. It might also help to add a sign denoting which fondue is vegan if this is being shared at a fondue party. Provide bread and other accompanying food that is vegan friendly.